Established by Ercolino and wife Mirella Capaldo in 1986, Feudi di San Gregorio is located in the tiny village of Sorbo Serpico in Campania’s Irpinia region. Along with the expert guidance of consulting enologist Riccardo Cotarella, one of Italy’s most esteemed winemaking talents who has been helping them since 1999, in little less than 20 years, Feudi di San Gregorio has emerged into the international limelight as a great success story in a region that, for many years, was cloistered in its traditions and consequently locked in a virtual winemaking holding pattern. They started planting in the mid 80’s and were marketing their wines by the early 90’s, with a philosophy to produce high quality wines from the historic indigenous grapes of Southern Italy. Feudi di San Gregorio has aggressively tapped into the enormous potential of Campania's unique terroir and ancient varietals by placing a thoroughly modern spin on indigenous grapes such as Fiano di Avellino, Greco di Tufo and Aglianico. Named "Wine Producer of the Year" at the 2002 Italian Wine Oscars (organized each year by the Association of Italian Sommeliers), Ercolino certainly shows no sign of slowing any time soon. Facing the Tyrrhenian Sea and representing one of the finest coastlines of Italy anciently favored by the Romans, Campania is a fascinating region, essentially mountainous, with irregular “massifs” and gentle hills divided here and there by plains and fertile valleys. On the horizon line of the Gulfs of Naples and Salerno, one can admire marvelous and enchanting islands of Capri, Ischia and Procida. Naples is the region’s capital, which homes to the world-renowned Amalfi Coast, the ancient tragic city of Pompeii, and the romantic Isle of Capri. The region was deeply affected by the Phylloxera, and it wasn’t until the 90’s, later than the rest of Italy, that Campania experienced a wine renaissance and took in consideration modern technology and equipment. Feudi di San Gregorio sources its grapes from the finest vineyards set in the rolling hills of the Irpinia region, located in close proximity to Mount Vesuvius. The volcano's legendary eruptions have laden the sandstone and marl soil with mineral-rich deposits of volcanic ash, forming a unique composition of soils rich in elements that nourish the vines. Feudi di San Gregorio produces a wide array of great wines from most appellations in Campania, mostly made with Falanghina, Greco di Tufo and Aglianico. Being originally brought there by the Greeks, together with Aglianico and Greco, Falanghina is one of Italy’s oldest white grape varieties. It has consequently had time to adapt to southern Italy viticultural conditions. Complemented with the volcanic-rich soil of Campania, it is no wonder that this variety is an elegant and distinctive reflection of its terroir. For the past 10 years, Falanghina has become the region’s fastest spreading white variety. Always very consistent and pleasing Feudi di San gregorio is a very reliable brand that has received many acolades and recognitions from the critics and the press. Feudi’s Falanghina comes from 20 years old vines, grown with southwestern and southeastern exposure on a bed of clay and sandstone with gravel, planted on a cluster of hillside vineyards at altitudes between 1,000 to 1,300 feet. Harvested two to three weeks later than most surrounding producers, the Falanghina grapes are transported in refrigerated trucks to the cellar to prevent untimely spontaneous fermentation. The hand-harvested bunches are individually selected and sorted to discard the bad ones, then soft pressed and cold-fermented entirely in stainless steel. Only the first-press juice is put in the bottle. 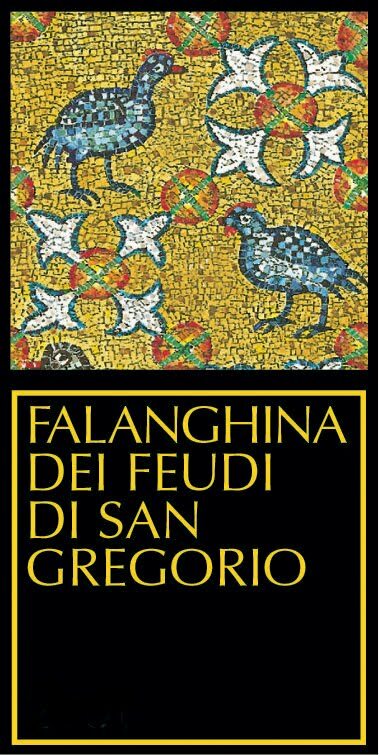 Vintage after vintage, Feudi’s Falanghina always captures the pure, complex, unadulterated expression of the fruit, resulting in really enjoyable, expressive wines. The 2008 vintage is no exception to the rule. Behind its pale lemon yellow color with a golden reflects on the rim, it offers a complex nose of honey, pineapple, banana, quince and pear, loaded with minerals. Medium bodied, yet nicely coating the palate giving an impression of richness and fullness, this wine is, supple, lush and lifted by beautiful acidity complemented by the minerality. Overall, it a nice, refreshing white with zesty acidity keeping the wine balanced. A spicy, honeyed minerality lingers on the finish. Serve as an aperitif or as a complement to any seafood, fish in sauce, risotto, and grilled vegetables. 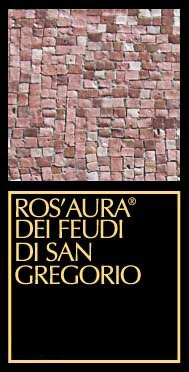 A few days ago I also tried 2009 Feudi di San Ros’Aura, a rosé wine made from Aglianico grapes which was quite stunning and that I highly recommend. This wine was made from 100% hand-harvested Aglianico grapes coming from10-20 year old vines grown between at 1,000 - 1,650 ft above sea level around the communes of Taurasi, Pietradefusi, Castelvetere and Paternopoli in Campania. Planted in deep soil with moderately large grains originally from ash and fallen pumice. After de-stemming, free-run juice underwent a 12-hour maceration on the skins followed by a temperature controlled fermentation stainless steel tanks. The 2009 Feudi di San Gregorio Ros'Aura Rosato was a revelation and a very enjoyable surprise, surely one of the most inspiring Rosé(s) I tried this year so far. It has an attractive, intense and fairly deep colorful rose color. The nose is inviting with ripe, candied wild red berries and cherry fruits intermingled with earthy and mineral notes. The palate is medium bodied with great minerality enhanced by fresh and lively acidity with notes of freshly crushed wild berries on the lingering finish. Great on its own, it will be perfect as an aperitif and delicious with chicken and turkey entrées, fish and grilled vegetables.